Remember, all are welcome in the Port Credit Legion which is open to the public. There is a cash bar with very reasonable prices on all drinks. CONCERT WITH THE JAZZ RANGERS! 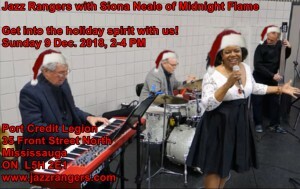 Join Siona in concert with The Jazz Rangers on Sunday, June 10th, 2018 from 2pm to 4pm at the Port Credit Legion, in Mississauga for an afternoon of great music and fun. Siona Neale of Midnight Flame will be joining them with her fabulous vocal skills. There is no admission fee but we will be passing a hat around and your kind support is always appreciated. The cash bar will be open as always for refreshments. End your Sunday right & get your mind set for the week with an evening of smooth jazz. Enjoy the sweet sounds of local jazz artists every 3rd Sunday of the month. Join us for a night of live contemporary jazz music with Midnight Flame! Our best ideas come in the middle of the night- midnight! A flame erupts in your mind and the right move is clear…The band Midnight Flame is all that. Pure, smart, hot energy at music venues, festivals and special events. This classy group of seasoned musicians is like a torch illuminating the jazz, blues and soul scene. Midnight Flame, fronted by one of Canada’s amazing cultural exports, Siona Neale, brings an impressive catalogue alive, encapsulating timeless jazz, blues and soul favorites. This wonderfully free event is supported by a grant from Mississauga Arts & Culture! Midnight Flame featuring Siona Neale (vocals) and James Ruben (guitarist, subbing for Brent Gelhar) will be giving a red, hot jazz/soul/blues concert at Artword Artbar's Art Crawl on Friday, October 14 (15 Colbourne Street), Hamilton, ON. $10 at 8 pm. 905-543-8512 Let's fill the hall! Were your friends, grocery store alternative, sustainable food farmers, artisans, playground, educators and natural haven. Open since December of 2009, The Emmet Ray has grown from neighbourhood favourite to respected whisky bar, carrying over 230 bottles from all corners of the world and counting. The band Midnight Flame is all that. Pure, smart, hot energy at music venues, festivals and special events. This classy group of seasoned musicians is like a torch illuminating the jazz, blues and soul scene. Midnight Flame, fronted by one of Canada’s amazing cultural exports, Siona Neale, brings an impressive catalogue alive, encapsulating timeless jazz, blues and soul favorites. The Lake Walk is a terrific event being brought to Bronte Village by a collection of the areas local arts and culture focused businesses and the Oakville Arts Council. Inspired by Hamiltons Art Crawl, the event will be a night of food, music and culture as well a special promotions and activities from the participating Bronte area businesses. The event runs along Bronte Road and Lakeshore Road West in Bronte Village, Time: 5:00pm to 9:00pm. The event will take place on the first Thursday of each month in Bronte Village: May 5th, June 2nd, July 7th, August 4th and September 1st. Lakeshore Rd (by Sammy's Famous Chip Wagon)?? Midnight Flame is available for restaurants, clubs, and private or corporate functions in the Greater Toronto Area.